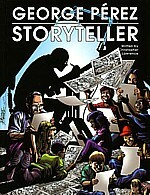 George Perez: Storyteller, published by Dynamic Forces, Inc., 208 pages, $29.99. George Perez. Mention that name to the average comics fan and you will, at the least, receive a respectful response. At the most, you could hear an excited verbal dissertation listing that fan’s favorite Perez works and how they impacted his or her life at the time. Well, their hobby life, at any rate. In an age when the word “icon” may be in danger of overuse, it’s safe to say George Perez is approaching such status. Now, there’s a definitive work covering the man and his artistic legacy - George Perez: Storyteller, by Christopher Lawrence. There is a reason why George Perez engenders heartfelt enthusiasm from so many fans. The man is an extremely talented creator. More than celebrating just that, however, Storyteller gives readers a peak at the whys and wherefores of his assignments to the many projects for which he is so fondly remembered, garnered from a very long and involved interview with the man, himself. His memorable runs on Marvel’s Avengers, D.C.’s Teen Titans and Crisis On Infinite Earths, as well as those well-known special projects, such as The Incredible Hulk: Future Imperfect and JLA/Avengers, as well as many lesser-known works, are addressed in a crowd pleasing hardcover edition. I especially enjoyed Perez’s candor in the book, especially when addressing his years-long struggles with meeting deadlines and overall professional dependability. In a profession that has, at times, seemed overrun with massive egos, it’s gratifying to hear a creator of Perez’s caliber claim responsibility for mistakes, and then work to make it right. That says a lot about, not just the work, but the man. George Perez: Storyteller is recommended for all fans of superhero comics, because, at some point, every fan has come into contact with his stellar work. It is also recommended for those interested in comics history, as the contributions of Perez are considerable. Find the book at your local comics shop, some bookstores and at www.dynamicforces.com . Interested in the exciting Oklahoma Cartoonists Collection and Toy andAction Figure Museum? Go to fourcolorcommentary.blogspot.com & www.youtube.com/watch?v=eCARtM5BvvU.